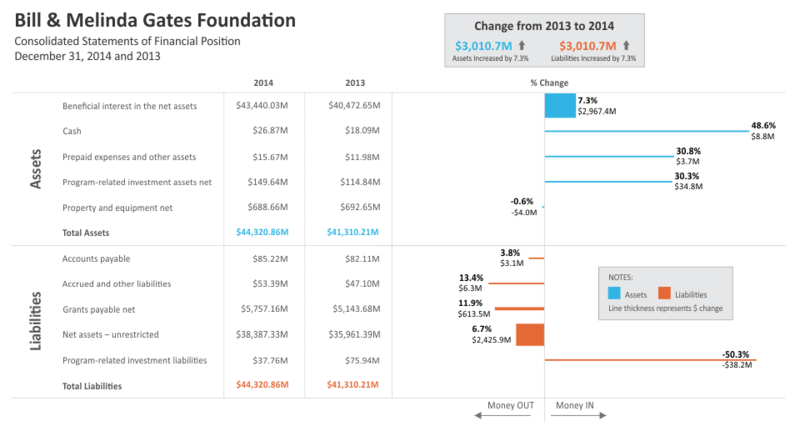 Last week I launched a challenge to redesign financial info from the Gates Foundation annual report. 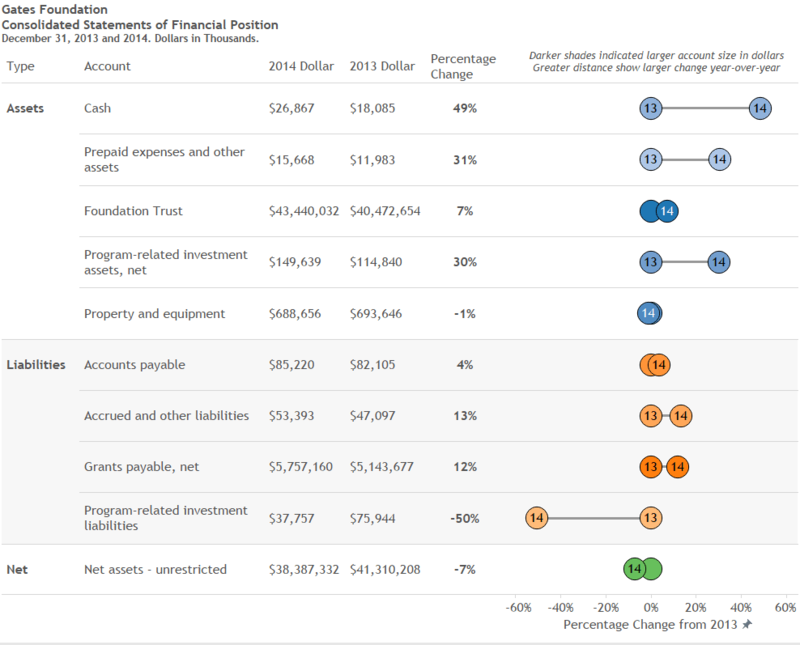 I was looking for entries that made the data more engaging than a table, matched the level of design of the rest of an annual report, and still reported each element originally presented by Gates. Every entry that hit my inbox made my heart grow bigger. Here they are, all 10!, along with the commentary submitted by the designer and any notes I had about the redesign. Read through and leave your thoughts in the comments. The take away message I gleaned from looking through these entries is that every real world design involves some kind of tradeoff. There’s almost always a compromise that must be made somewhere. Real life design is much harder than armchair critique. I’m starting with Heather – her entry is the longest but she makes a point about not using percent change, which is what most of the other entries did. And I’ll end with Joshua because his made me laugh. My materials should be considered a draft of a concept – not as a finished viz. I’m not submitting it because I believe it is the single best option – there never really is – but rather because I think it’s an interesting conversation that I’d like to be part of. general public, not just the typical accountant. I think this is a great idea. to tell a story of stability and provide transparency as to sources of assets and liabilities. much change. I also struggle with the inconsistency of scale here. Additionally, numbers as large as this really don’t mean much to most folks. the basic design I’ve developed would synthesize well. I kept the font standardized, etc. The viz is not meant to replace the traditional table. The table needs to stay to satisfy the portion of the audience that prefers a traditional approach to accounting. My viz is meant to accompany the table – ideally in a side by side two-page spread. distribution of the sources of assets and liabilities. most of its assets are unrestricted, which is very good. SE Note: Emily blogged about her submission. I told her that I think one of the things that gets me is that financials list the most current year on the left, when we usually read oldest on the left. For example, your first line looks like its going down, but its really an increase of 49%. I took the liberty of swapping the years in my visual but I don’t know that it would be allowed. In terms of fixing the shortcomings, it adds additional comparability between the data by adding the percentage changes from 2013-2014 and the total percentages between 2013 and 2014 for assets and liabilities. It slightly fixes the inconsistencies across scale measurements by putting the “in ###s” underneath the labels in the X-axis, but even with those it is still difficult to compare across categories. I separated out the totals for liabilities and assets instead of having them in the same line as the other subcategories, which allows more ease of interpretation. 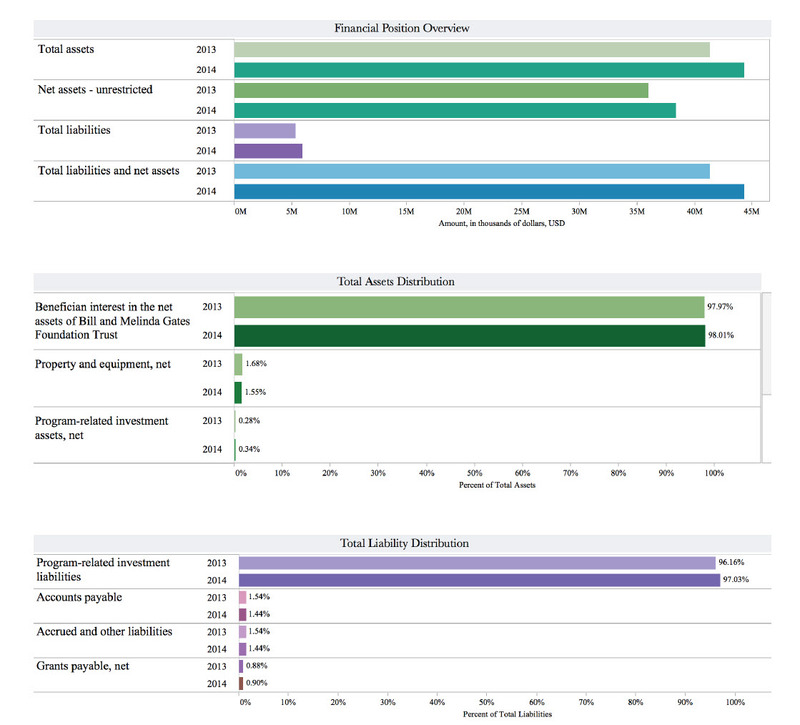 This example goes to show that there are a variety of ways to visually represent data, and that when you report data you should know your audience and their style/level of competence regarding various data visualization techniques. The type of story they want to see will influence the types of visualizations you use. SE Note: You might be cheating by expanding this on to multiple pages! But maybe you’re just a dreamer who thinks data viz deserves more than one page in an annual report. In which case, I’m totally on board. I agree with you: a line graph is the best way to show variation between two years, so I’ve also used for this challenge – i took yours as inspiration for mines because they’re quite elegant! But i have decided to do it a bit differently than you: to focus more on the relative change than on the absolute change. So, I used fluctuation in % rather than in $. 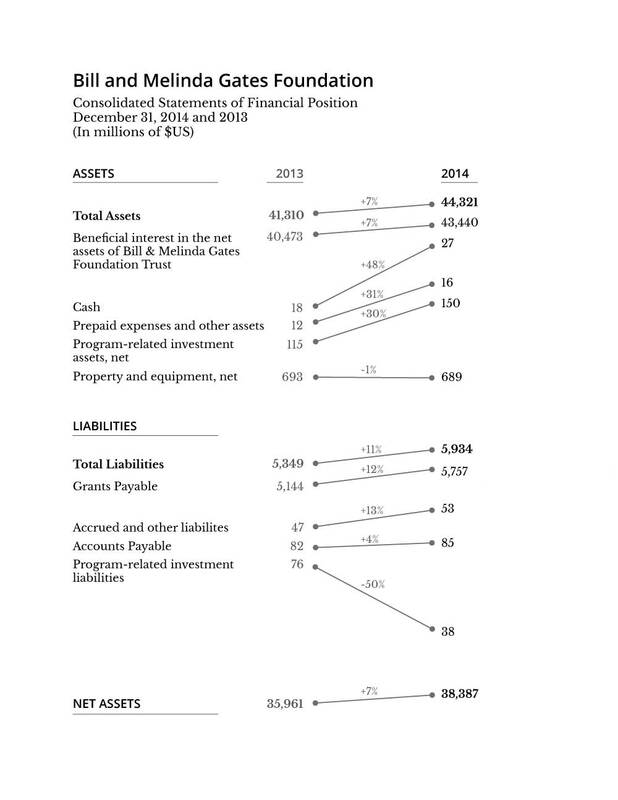 Other thing I did differently was to separate total net assets and liabilities and i highlighted them on the top. So, if the reader wants to know what exactly which asset or liability contributed to the change on the big picture, s/he can look down and find easily. I think this graph won’t replace the table and i think we should have both: we do it for the cool kids and for the nerdy bureaucratic kids. Other thing i did was to take away all the year from the graph. The first one has it, the titles show it, i think we don’t need any more clutter. SE Note: I like the simplicity but I think we have to have the actual numbers in there, too. Great work! The way my solution addresses those shortcomings is by simply not distorting the data. 1. Using the same scale for the bar charts representing the amounts in USD for the years 2013 and 2014–because dollars are dollars, whether they are in 2014 or 2013. 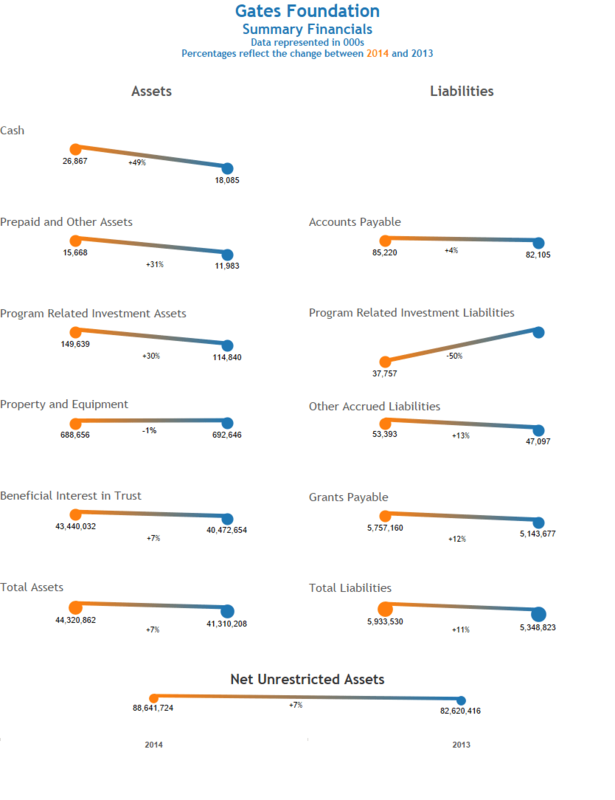 It’s clear by looking at the horizontal bars that the majority of the assets (98%) are in Beneficial interests, followed by Property and equipment (1.6%) and everything else is negligible (0.3% or below). Just imagine that $ 43.4 billion is 2,767x bigger than $15.7 million. That’s a huge difference and it should hit the viewer in the eye. 2. Using a simple variance bar chart for the percent change. You can quickly see that “Cash” had the highest percent increase–and not “Beneficial interest” or “Total Assets” as perceived from the slope of the lines in your chart. SE Note: I like the addition of extra data, like reporting on the past 7 years, though it’s kind of cheating in this challenge. However, the bar graphs are an issue for me because all but the first ones are undetectable. What’s the point of having a visualization there if you can’t see it? The only story it tells is that the first line item is a lot bigger than the others. But again, every solution here is going to have a design tradeoff somewhere. Thanks for your entry. You’re the only one who took issue with my design on Twitter and actually tried to work out a full solution. I came across your challenge via Twitter to update the traditional Balance Sheet. I like your focus on clean and simple visuals to show increases and decreases year over year (YOY); however, I have some concerns. My major concern– as you mention– is the scale on the y-axis and how the graph axes are relative to the specific account and not the entire dataset. As a result, it is difficult to compare– to quickly comprehend the percentage of increase/decrease and also hard to understand the size of the account.My visual hopes to encourage adoption by keeping a familiar format while utilizing visuals to make it easy to see increases/decreases in accounts YOY and relative size of accounts (in dollars).My final result shows a chart where one can easily find dollar value of the finances for 2014, 2013 and the percentage change. I ordered the accounts in the same order as a typical balance sheet. The visual shows change YOY by plotting the percentage change from 2013 as bubbles. Accounts with longer lines have greater change– either positive or negative (right or left, respectively). 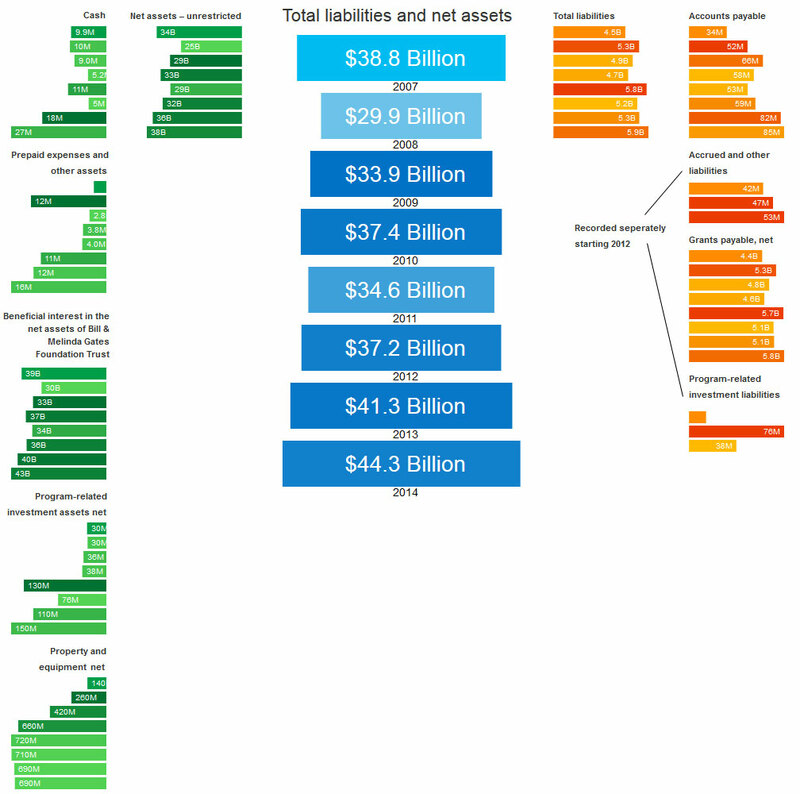 The color of the circle shows assets (blue), liabilities (orange) or the net overall change (green). The darker the shade, the larger the account in dollars. SE Note: You know I am a fan of dots, so this might be my favorite. It would be cool if we had data available to help us interpret, like, how much change is good? We don’t know the exact context in which this graphic was originally prepared, so I made some assumptions about the purpose and audience of the graphic in order to guide my redesign. 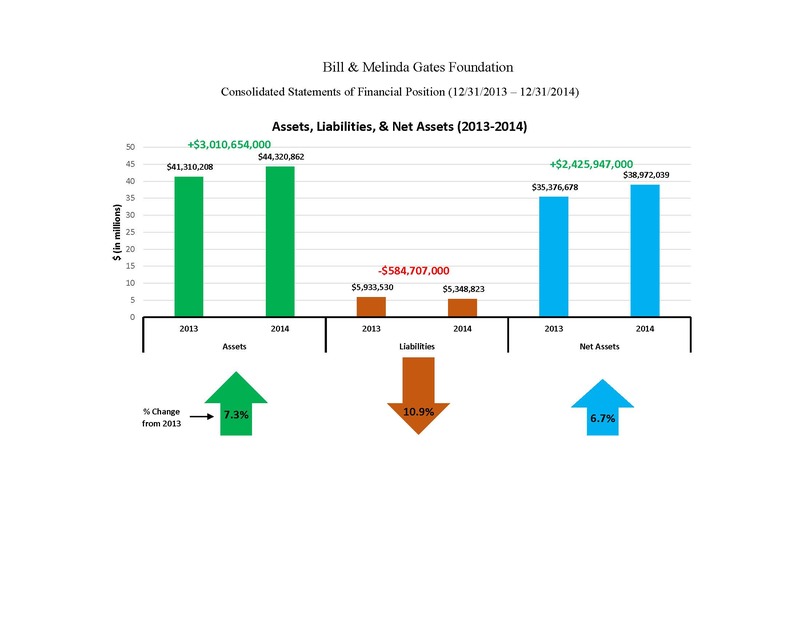 The graphic comes from the Consolidated Financial Statements of the Bill and Melinda Gates Foundation. It’s a somewhat technical document that I assume is intended for people closely involved with the foundation, like partners, investors, etc. It is not a document intended for the general public or for internal accounting people at the Gates Foundation. The audience expects some detail and is familiar with financial tables, but their main interest is in overall trends and magnitudes. Given the audience, my strategy was to maintain something of the financial table look while adding the minimum number of visual elements to communicate trends and magnitudes. I didn’t want to lose the sense of accounting integrity that I assume the original table suggested to the audience. What the original table is lacking is any visual indication of the changes in value from 2013 to 2014, which I assume is one of the two main points of interest. I think the other main point concerns the magnitudes of the values and the fact that there is one dominating value in each category, assets and liabilities. So here’s what I did. The only visual elements I added were sloped lines connecting the values of different years that indicate the percentage change in value. In addition to the lines, I rearranged the text so that values were organized by magnitude and by amount of change. I also got rid of the last item “Total liabilities and net assets” because it’s exactly the same as total assets (I’m sure the accountants won’t like that!). 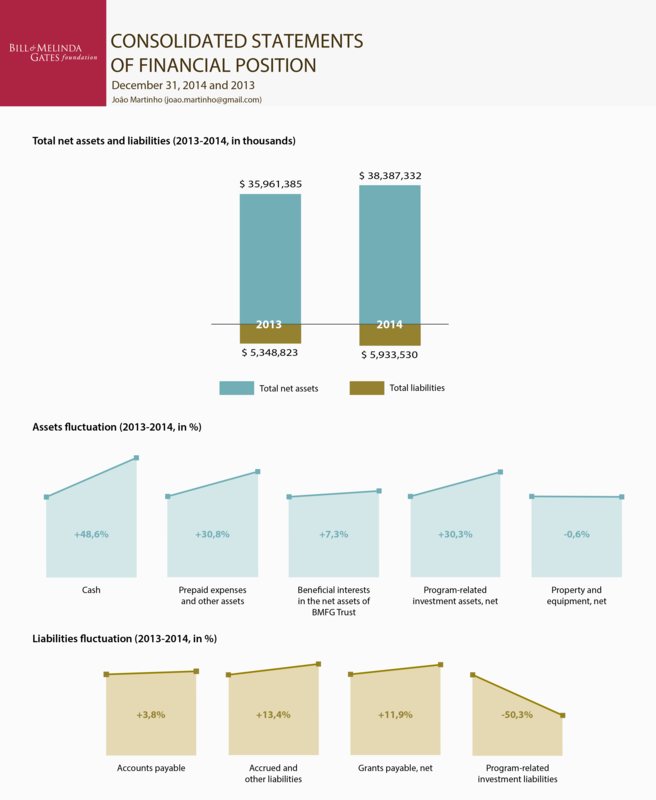 SE Note: I like the simplicity though it doesn’t quite match the beauty of other annual report pages. How did you determine the scales to use for your slopes? I did not attempt to find a story in the data, I am merely presenting the financials in the best way I could think of, limiting myself to about 1-2 hour to design and produce the visual. I decided to show absolute amounts in a tabular format and visualize % change from 2013 to 2014. This gives a quick indication of where the largest proportional shifts occurred. So as not to lose the picture of actual $ amount changes, I coded them as line/bar thickness. Note that I also reversed the scale on Liabilities so the decrease in Liabilities is on the same side of the graph as increase in Assets. I wanted to give a consistent indication to what I labelled beneath the graph ‘Money OUT’ and ‘Money IN’. 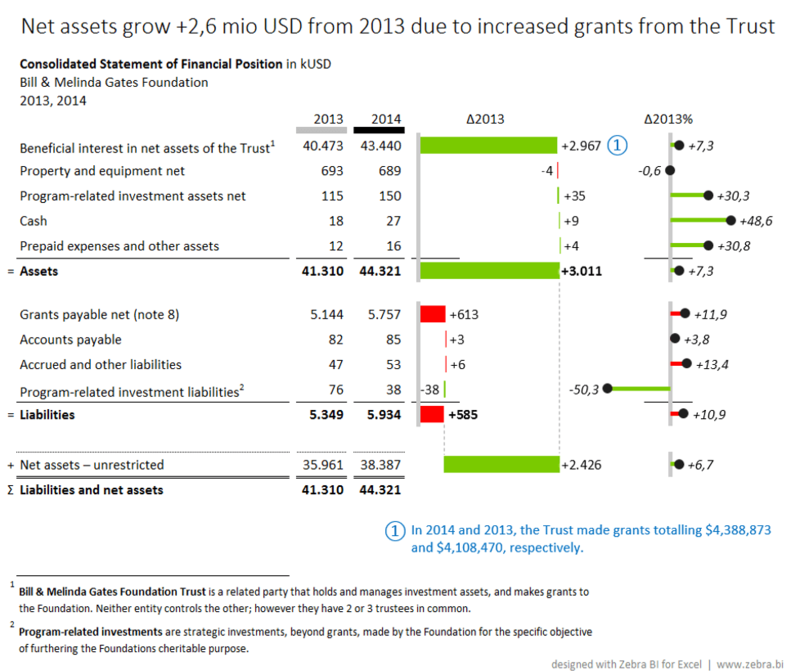 A boxed summary above the visual gives an additional emphasis to the big picture of total changes and I leave it for the viewer to conclude that total changes in assets and liabilities matched. SE Note: Width and height can be tricky! What do others think? I think the multiples in this case just won’t work. In both assets and liabilities the top category dwarfs all the others, both in absolute values as well as in changes from the previous year. That’s why I focused on exposing the contribution of the changes to total assets, total liabilities and the resulting net assets. SE Note: Andrej said he has a longer explanation of his process that he is folding into an upcoming blog post. Keep an eye out here or here. Here is my poor attempt at a redesign. I thought the concept was good on paper when I sketched it out. But upon actual creation with the data and colors it’s clearly not an effective visual. Ok, it’s just ugly bad. When I realized it wasn’t working I pretty much quit, knowing I didn’t have time for another go. Instead of hiding my shame and not entering, I thought I would at least share my thoughts & goals and provide as an example of half-complete datavis gone wrong. 1) I wanted to start with a layout that people would relate to the balance sheet. I was thinking of a ledger or balance scale where assets are on one side and liabilities on the other. The left & right alignment isn’t bad, but needs some more styling. Maybe make it look more like grid paper. 2) Historical context. A quick google search revealed the same company has been putting out the same annual report for 8yrs! If they have the data, why not use it? 3) Because the values for each line item were so drastically different, I wanted to draw more attention to years with greater % change. Which is color coded. This might have been the worst idea in practice. Really makes it busy and takes away any focus on the visual as a whole. SE Note: Great candor and an excellent reminder that this dataset was tough to work with! Sketches are one thing but actually getting in to the data introduces all kinds of challenges that make us compromise our ideal in one way or another. Tradeoffs, tradeoffs. Thanks for showing us your work in progress.